I posted my first post on March 1st, 2011. Ruth Ayres, Mary Helen Gensch, Tara Smith, Tam and Elizabeth E. (anyone remember?) all commented. In the next days, Elsie and two of my colleagues who did the first SOLC challenge with me commented. One of those colleagues is now close to publishing a novel! It started with a blog and our writing group! Very soon, Ruth Chandler Ferris commented (Storykeeper). We are still in touch. Often, there were bloggers named Bree and Diana(LitCoach). They were around for a few years, but finally stopped. I wonder where they are now? By the middle of March, Deb Day, Christy Rush and Carol Wilcox had commented. Isn't it wonder-filled that so many of us are still writing, that many of us have met and plan to meet again? I celebrate those with whom I connect through blogging, and other media, those I'm come to admire for their grit and craft, to know because they share their lives, and listen when I share mine. Many of your names are not listed above because I hadn't met you yet, but through the different groups, there are others of you I've come to know and love hearing what you have to write. I've met some of you, too, and am hopeful others of us will meet in person someday. Why am I writing those words above? Because today I celebrate my one thousandth post! 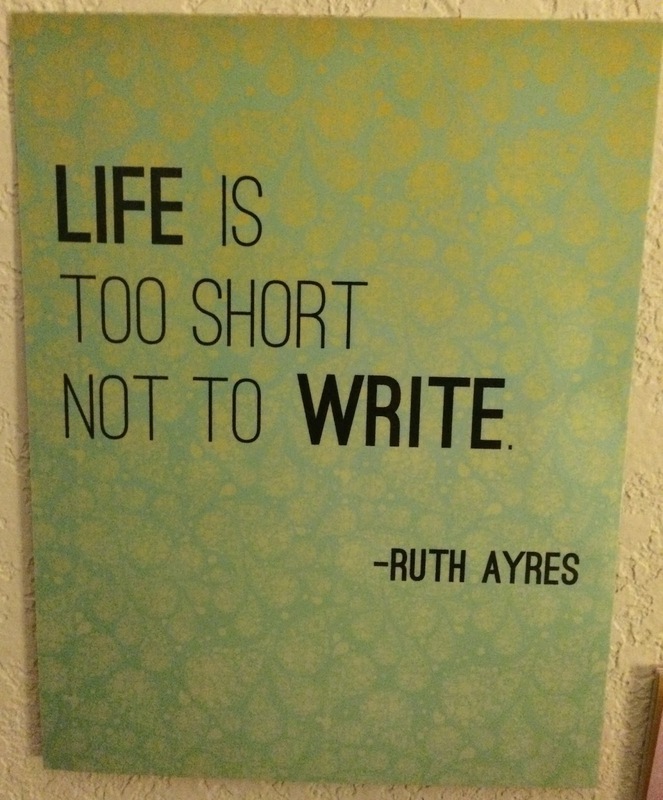 Last year Christy Rush Levine made laminated quotes from some of Ruth's wise words. I hung it up in my house last summer, took it to my office in the autumn, and moved it to my classroom in November. 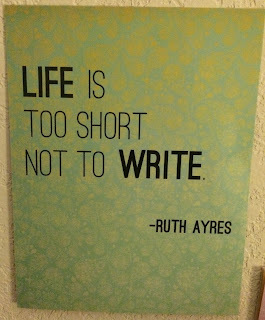 Now it's back home, on the wall by my computer where I do much of my writing. AND - I am also celebrating this past week when I had my granddaughters Ingrid and Imogene every afternoon Monday through Thursday. 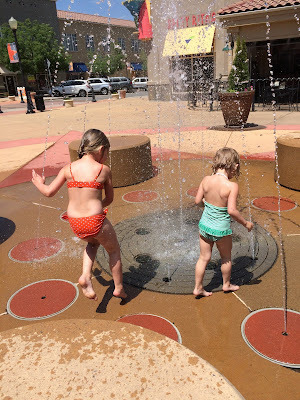 We went to the library, the park, the sprinkling fountains near my home, the Denver Museum of Nature and Science (mostly mythical creatures), and stayed home to play and draw and read books, lots of books! It was a lovely week! On a hot, hot day, good to get shivery cold! They were thought to be mermaids in ancient times. Oh, such fun to pretend! Imi had on a green dress, thus the picture bleeds through. Saying goodbye to their friend outside! One more thing for today especially. It's a favorite quote from a favorite book, the Anthology for the Earth, Judy Allen, ed. These words are inspiring to me. I hope they speak to you as well. The adoption of the Radical Change Scenario, which is the only one that can possibly save our planet, means that each one of us has to take total responsibility for all our actions, without even asking ourselves whether our own tiny contribution will make any difference or not. We are not responsible for what other people do, and, except by example and persuasion, we cannot influence them. But we are responsible for what we do... we must believe (because we all know it in our hearts, which is really the only way we can know anything) that Nature, or God, or the Life Force--but something, call it what you will--has fitted each one of us with a thing we call a conscience... We make our own Heaven or Hell. Linda, a happy 4th of July today and congratulations on your long line of blog posts because life is too short not to write. I always love hearing about the girls. What a wonderful week of celebrations. I hope your Independence Day with the family brings sparkling wonders. Thank you, Carol, it was a terrific week! Hope your day is lovely too. Congratulations on writing so many posts. And a special thank you for sharing the very important reminder on living from John Seymour. Thanks, Bernadette! I'm happy you liked the words by John Seymour. I do, too! Wow! Congrats! Your quote that you end with is incredibly inspiring and true. What beautiful words to reflect on today. Thanks, Marcie, & I'm glad you like the quote! Sounds like you had a really fun week and built lots of memories with your girls. 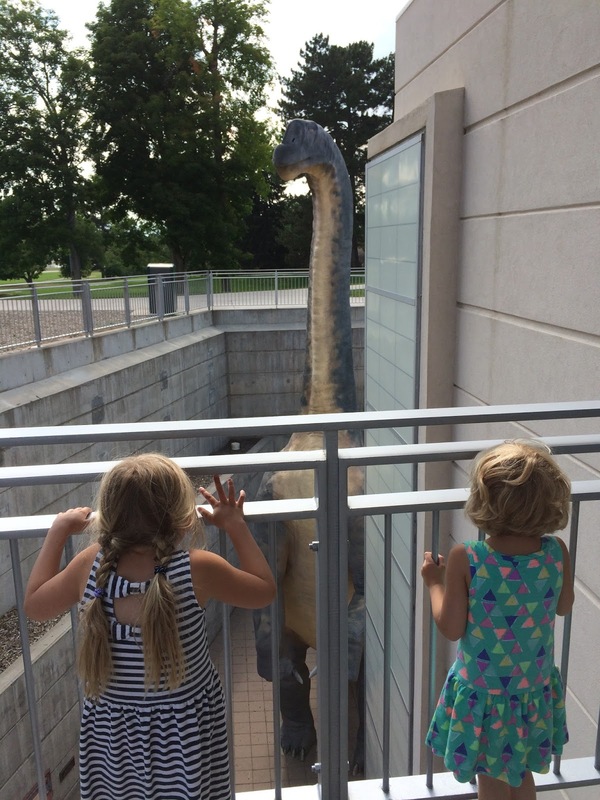 I'm hoping to get to the mythical creatures exhibit. It would take a re-visit for me, Carol. We didn't get to read all the background material. It is fabulous, though. 1,000 posts!!! Wow! Yes, blogging is powerful and a wonderful writing forum - so much support out there. It definitely keeps you going. I'm sure you'll publish 1,000 more! Thanks, Holly, will certainly try! So much life and living here in your post. And 1000 posts- what an accomplishment. And what a wonderful record you have of these last few years. Thanks Lisa, yes, it's been quite a journey. So this is what I am thinking...all those fireworks you are likely to see or hear tonight...grab a bit of it for this celebration...for writing 1,000 posts! Think of the arc your life has traveled during those times and how writing has captured it. Amazing! There are journeys more to come and into territory unknown. Writing will be there to help you record and make sense of it all. Write on! Thank you! I certainly will be celebrating all day, Kim. It was just over a week ago that I noticed the number. I almost missed it! I consider myself one of your tribe even though we haven't met face to face...yet. Your posts and your comments always inspire me to be the best I can be. I've taken a self-imposed blog break while on vacation and yet find myself thinking about what I will write next. The commentary goes on in my head all the time. This is what blogging has brought me, that inner voice that notices. Noticing and noting connect us. It may take me a few more years to get to 1000 posts, but I will get there. 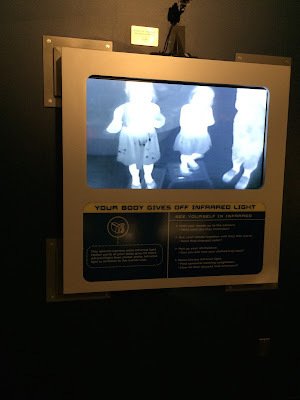 Yesterday I went to the Chicago Museum of Science and wished I had grandkids to enjoy it with. I did do some silliness, but children have a way of freeing you to really enjoy life every day. 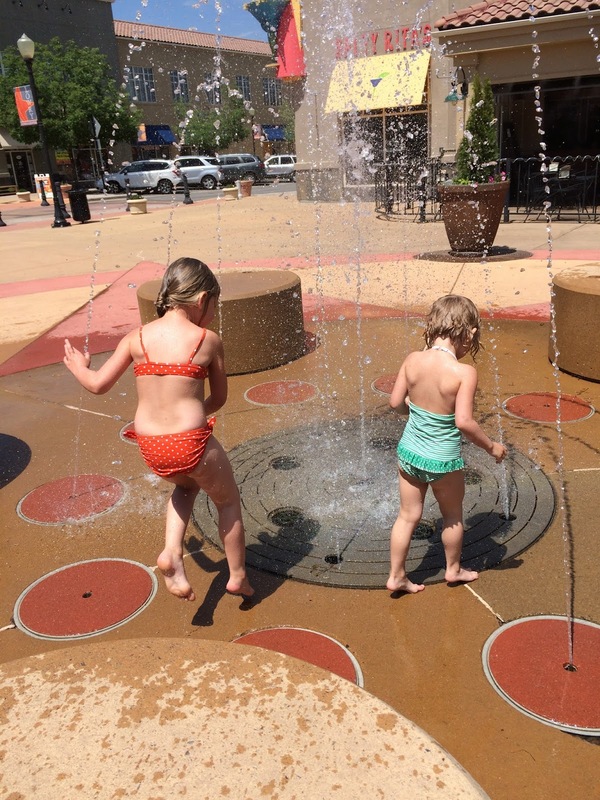 Love those grandgirls in the fountain! One of these days! I may just have to fly down to see & meet you, Margaret. It would be a pleasure. We have connected in so many ways. I hope you're having a good blog break, & thank you for reading & commenting anyway. I bet you'll have the grandkids soon enough! It is a delight! One thousand posts?!?! Congratulations!!! That's such a wonderful achievement and it deserves to be celebrated! WOO HOO!!! The connections that I've made through blogging have changed me as a teacher and as a writer!!! I always look forward to reading your posts and learning something. I'm grateful to be part of this blogging community! Keep Writing!! Happy July 4th! Thanks, Michelle, it is wonderful to make the connections, I agree. I look forward to see what you're writing too! Congratulations on your 1000th post. That's quite an accomplishment. I enjoyed reading about ways you connect with so many people. I, for one, am looking forward to your next 1000 posts. Thanks, Cathy. And part of these next posts will be with you and reading on #CyberPD! Wow! 1000 posts! Now this is a celebration! I'm humbled to have my name listed among so much rich writing inspiration. And to see that quote on your wall...only to grab my notebook, jot the words, and then realize the reference is me! There's something very humbling about that. Ha, Ruth, you must be getting a little forgetful-te he. Thank you, too, for all your support! Cheers for a wonderful holiday! 1000! That is impressive! I envy the stamina that takes, and I take inspiration from you and your writing community for my own journey. Thank you for the quote. It is important to remember that our tiny contribution is all we have, and therefore it isn't tiny at all! Thanks, Cathy. I'm happy you enjoyed the quote. It's truly a favorite of mine! What a wonderful way to celebrate today. Thank you for writing and for all your support for me and for all of us who have followed on this path. You're welcome, Anita. I always love reading your posts! Happy Independence Day! Wow, 1,000 posts!! And how many comments have you made in that same time period? I believe a great multiple of that 1,000! The way you reach out to others in the ever growing tribe is a beautiful example of being"responsible for what we do." You are my model. Thank you for everything. You're welcome, Julieanne. It seems like a big, and very good, conversation. Thank you for all you write, too! Thank you for being so kind and encouraging. Thank you, and you're welcome, Loralee. I'm looking forward to more! Amazing! 1000 posts is an incredible milestone! May you continue to grace us (your readers) with lots of stories and insight! Thanks, Chris. It's a pleasure writing for sure! Linda, 1000 posts!!! Congrats on this awesome accomplishment. I love the pics of your week with the grand girls. And what a grand time! 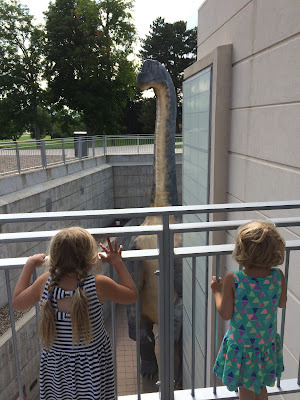 "We went to the library, the park, the sprinkling fountains near my home, the Denver Museum of Nature and Science (mostly mythical creatures), and stayed home to play and draw and read books, lots of books!" Love that this long list of activities was book ended by a trip to the library and reading, lots of books! I found that each day it was more and more fun to explore new books with them. They weren't interested in just the same ones. Some they had picked at the library, so having their own choices helped. Thanks, Ramona. Wow! Big congratulations on your 1000th post Linda!! I look forward to reading the next 1000. How wonderful that you were able to spend time with your grand daughters! They are so sweet and I am sure they loved spending time with you! Thank you, Gigi. It was a very fun week with the grand-girls. Now I need to start cleaning out all those books! Linda, what a lovely post to return to! Congrats on 1,000 posts! That is quite an accomplishment. 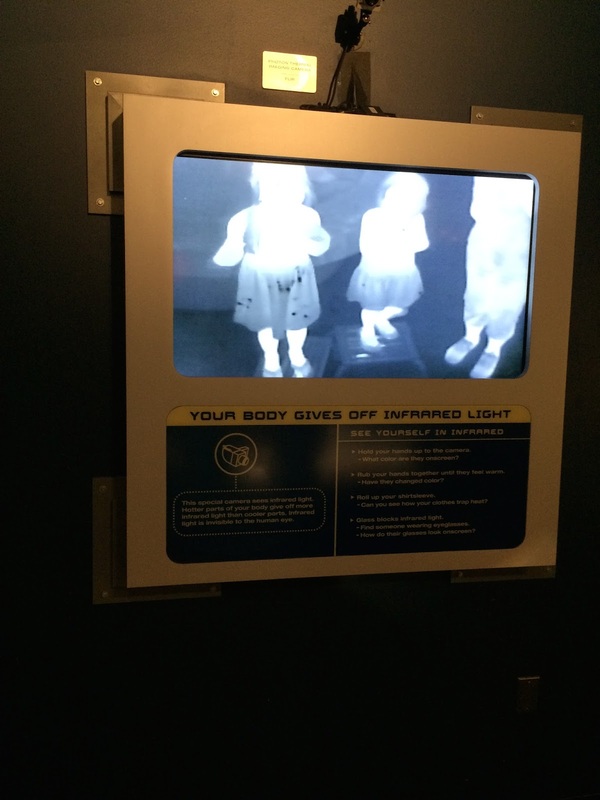 This exhibit you spent time at looks fascinating and the girls look like they are really enjoying the time. Much to celebrate indeed! Thank you! The 'mythical creatures' exhibit is awesome, & as I said earlier, I need to return in order to spend time reading the stories about each one. Congratulations on your thousandth post! Writing has definitely changed the way I think about the world. I enjoy reading what you have to say each week. It looks like you had a wonderful time with your granddaughters. How fun to get to spend every day with them this week! Have a wonderful week! Thanks, Andrea. Yes, it was a good week, & I agree that blogging is a good and positive part of my life. Congrats on the milestone! To 1000 more! I am for sure looking forward to all the things you have to say! Thanks, Earl. I look forward to your posts, too! What a wonderful week and congrats on 1000 posts! Congratulations, Linda! 1,000 posts is quite a milestone. I feel so fortunate to have met you at NCTE two years ago, and that I can continue to learn from you in countless ways through blogging. 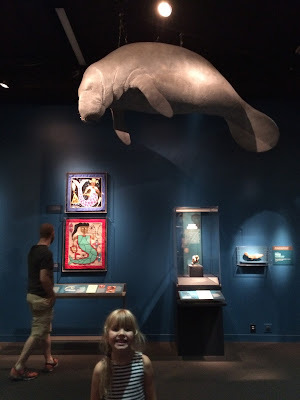 That mythical creatures exhibit looks amazing. So glad you had such fun with your granddaughters. Thanks, Catherine. I'm glad we got to meet too. Maybe someday again! Linda, you are a gem! Your 1000 posts have touched the hearts of many and we celebrate with you! I am so glad I commented then and we have met. My life has been enriched, blessed by you. Thank you! Hooray! Your pictures radiate in happiness. Your granddaughters will have rich memories of you. I look forward to reading more. Thanks, Mary Helen. It's been a pleasure being with you a few times these past years. Hope you're having a good summer and your mother is doing better! Little late to the party, but my "Wow!" and "Congratulations!" are as strong and warm as everyone else's. I like that you didn't stay with the blogging celebration only (even though it would have been a grand celebration by itself) but included your granddaughters in this post. And the quote is a gift we all appreciate. Thanks for stopping by, Terje. It's great to hear your thoughts!